I think I did pretty good! Considering I worked all week and made some good progress over the weekend. I’m proud of myself. :) To see the week’s progress, check out THIS POST. 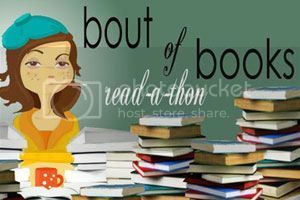 Read-a-thon #insixwords: Work did not slow me down! I love how you’ve arranged your up-dates — they are so neat! Have fun with the read-a-thon! Good luck! I’ve been subject to Amanda’s arm twisting myself. You were wise to give in. ;) I’ve never listened to an audio book, but I’ve wanted to read Delirium. Have fun! Good luck chica! We’re on the same boat as far as work but, I think we’ll manage at least one book, right? Yay! I’m glad the arm twisting worked. So, I take it you’re trying for more than 70 pages this time? Sounds like fun! Read-a-thons kind of stress me out, but they’re so helpful in knocking down the TBR. Best of luck! My week’s going to be fairly busy too, plus I found out about the challenge a little late, so I’ve set myself the goal of finishing 3 books. I managed to get through 1 last night before bed, but it was a fairly short book. I hope I can get through the other 2 that I want to read! Happy reading, and I look forward to seeing your updates! Delirium’s a pretty good book, isn’t it? I read it last year and reallt enjoyed it! I want to read The Statistical Probability of Love at First Sight SO bad! I hope you love it! I hope I get at least half a day of nonstop reading this weekend! It would be such a relief from the busy day-to-day life I live. Good luck with finishing your books! Lots of reading this week! I think I only finished two books this past week. So happy for you. I know you were a little worried about participating during your busy time of year. Going to have to try Shannon Staey, if she has you coming back so soon. See you at ALA. Hope my tagging alongish…well tell me to back off if I become annoying. Congrats on getting 3 done! I got 2 myself. Delirium is on my list of books to read, hope it’s good!